Engineered plastic, stainless steel and teflon lens holders are made of quality materials and are designed for production use. Available with adjustable spring-loaded locks to safely and gently hold the lenses between the V-shaped jaws of the retainers, preventing the lenses from slipping or rotating while being tinted. The lock and sliding retainer can be aligned in a non-horizontal position to secure lenses of slightly different sizes, thicknesses, and shapes. Several models are available to choose from, depending on your needs. Model V1 is available in all three materials. It holds one pair of lenses and is recommended for UV treatment and bleaching. Item# T338 Plastic, T455 Stainless Steel, T228 Tephlon. pair of lenses. Recommended for lens tinting, bleaching, and UV treatment. Item# T340 Plastic, T322 Stainless Steel, T330 Tephlon. Model V1-RS is available only in stainless steel. It has a split sliding retainer that will hold two lenses of slightly different sizes, thicknes ses, and shapes. This model is strongly recommended for gradient tinting (especially while tinting pilot shaped lenses) and when there is continuous movement of the lens holder. Model V2 is available only in engineered plastic material. It has the same features as Model V1, except that it holds two pairs of lenses. Model V2-R1 is available only in engineered plastic material. It has the same features as Model V1-R1, except that it holds two pairs of different size and shape lenses. • Faster tinting, with better color shade consistency. • Digital temperature control, with detachable temperature probes. • Nonstick tanks for easy cleaning. • No boil-over. Lid position will not affect the temperature. Vortex Digital Tinter 4 is an advanced generation four vat (tank) tinting system combining four accurate digital "auto-tuning" PID temperature controllers with bright LED displays showing the desired (set) and actual (measured) temperatures of each tank. 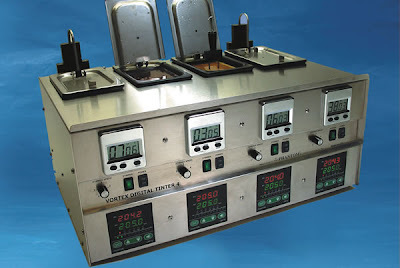 Each tank has an individual digital process timer to monitor tinting times. Vortex digital tinter 4 incorporates variable speed stirring, hinged-lids that do not need to be removed when tinting lenses, and special coated easy to clean stainless steel vats for heating lab chemicals. The temperature probe located in each tank precisely measures the solution temperature (not HTF temperature), preventing messy boil-overs. The detachable probe allows for easy vat removal and cleaning. Vortex 4 is simple to use and is the perfect machine for fast absorption of tints and UV into coated polycarbonate, hi- index, and CR39 lens materials. Nonstick Vat and stirring bar. Nonstick (Vat) prevents dyes from sticking and caking to the walls, therefore making vat cleaningeasy. Power Requirement: 120 VAC, 60Hz. Refer to the Vortex Digital Tinter Instruction Manual. No slippage, with excellent adhesion properties to all lens materials and slick coatings, such as uncoated and coated CR39, Polycarbonate, Hi-Index, and Glass. The adhesive system implemented in the OptiSafe® Lens Blocking Pads provides the appropriate amount of adhesion to prevent slippage while edging lenses, yet the pads are easy to remove leaving absolutely no residue. 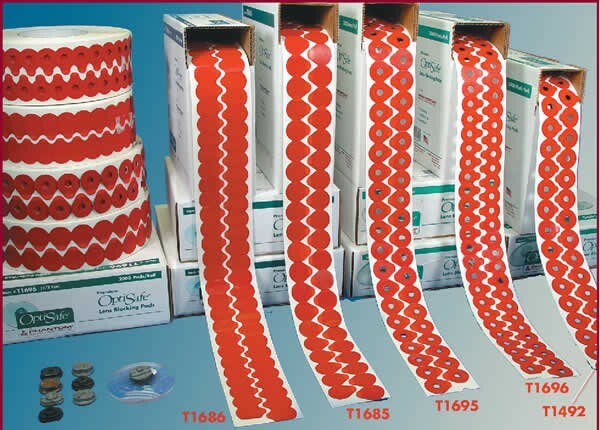 The OptiSafe® Lens Blocking Pads are the ultimate solution to all your edging problems. Available in different sizes to fit metal and plastic blocks. T1695: 24 mm diameter, round, with 7 mm center hole. T1696: 18 mm x 29 mm 1/2 eye, with 7 mm center hole. T1685: 24 mm diameter, round, with solid center. T1686: 18 mm x 29 mm 1/2 eye, with solid center. T1492: 26 mm diameter, round, with 7 mm center hole. T1412: 17 mm x 32 mm, with 7 mm center hole. T1422: 17 mm x 32 mm, with solid center. 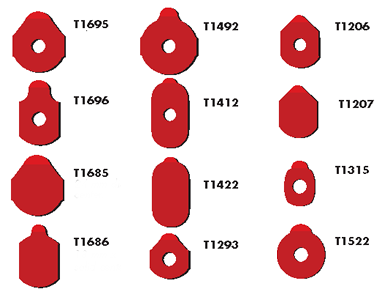 T1293: 18 mm round, with 7 mm center hole. T1206: 17 mm x 24 mm, 1/2 eye, with 7 mm center hole. T1207: 17 mm x 24 mm, solid center. T1315: 14 mm x 21 mm, with 7 mm center hole..
T1522: 22 mm round with 7 mm center hole.